Even 20 years later, the locale that served as the setting for the classic baby boomer film, "The Big Chill,"continues to attract people longing for a connection to the past and the peace of mind found only in a town like Beaufort, South Carolina. The almost magnetic draw the town has on people explains why Beaufort County is already home to more people of retirement age than any other county in South Carolina. About 12 percent of the total populationin the coastal county is over 65, and that number is steadily rising. Between the mild year-round climate, beautiful historic setting and easy-going small-town Southern lifestyle, the draw to the area is obvious to all. Beaufort is such a beautiful and accommodating place that the motion picture industry has chosen it as its first choice as the archetypal Southern town. In addition to the pivotal role Beaufort played in ?The Big Chill,? the town's historic buildings and scenic backdrops were used in exterior shots in "The Great Santini," "The Prince of Tides," "G.I. Jane" and "Forrest Gump." "People are drawn to the beauty but find that Beaufort is more than just a pretty face." People are drawn to the beauty but find that Beaufort is more than just a pretty face. Long known as a sportsman's paradise, Beaufort offers world-class boating and fishing, is in close proximity to world-class golf courses and has some of the best hiking in the region at Huntington Island State Park. For those more inclined to urban pursuits, Hilton Head Island and Savannah are a short drive away, and Charleston can be reached in a little more than an hour. The town's rich history dates back more than half a millennium to explorer Christopher Columbus. Tabby ruins of Spanish explorers and what's left of armaments erected later to protect early English colonists against the Spanish can be found among the area's marshes, tidal pools and freshwater creeks. 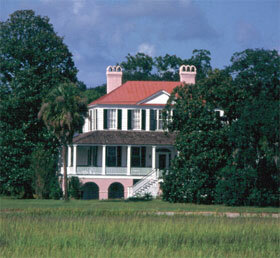 Beaufort is surrounded by plantation grounds, many of which still stand defiantly more than 140 years after Sherman's troops burned much of the South to the ground near the end of the Civil War. Downtown Beaufort falls under strict preservation guidelines to maintain the dignity and integrity of the antebellum mansions that grace its narrow streets. The historic district is one of only three National Historic Landmark Districts in South Carolina.